Technically, Dave is assembling our AcuRite sensor set here, but you can just pretend the drill is unscrewing rather than screwing. Ha ha. 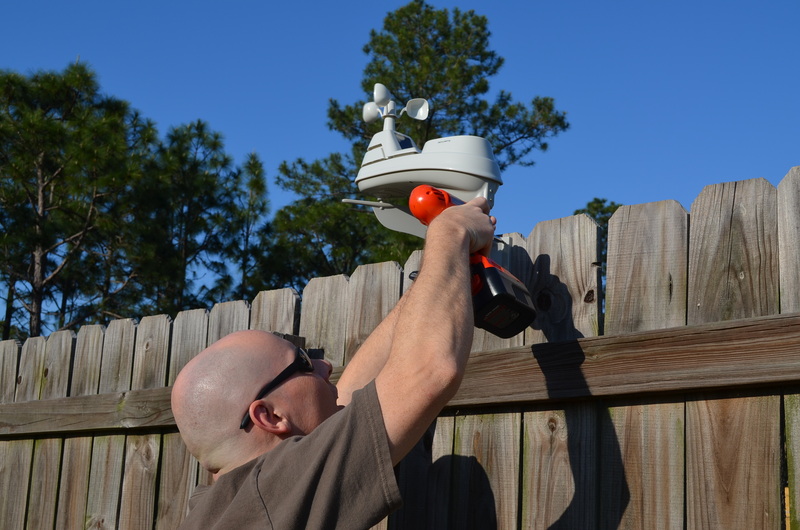 This afternoon Dave disassembled our two weather stations in the backyard. One of them (KFLGULFB11) had been reliably reporting backyard weather since December 2010, the other (KFLNAVAR18) was a test weather station whose review post is coming up soon on GeekMom. Our Davis Instruments weather station sensor set is beginning to get rather tired. I predict we’ll be getting a new one by the end of the year. We will retire these two names and will be resuscitating the weather stations in July in Colorado! I’m sorry we didn’t have more fanfare or photography with this, but it’s really busy around here, the packers will be here TOMORROW!